Flatbed trailer tarping system made simple and quick. And most importantly, safe too because workers stay on the ground while tarping their loads. Accidents occur every year from flatbed loading and from tarping flatbed loads. Some of these falls create permanent disabilities and even death. Having a safe way to tarp your load ensures everyone goes home safe and saves money. Regardless of where you’re located, our experts can help your operation achieve a high level of safety and improved productivity. We will visit your site to analyze the type of work done on the flatbeds, including understanding how the flatbed truck is loaded, the type of load and what the operator typically does on top of the truck or load. After that, we’ll present you with a solution that will ensure your compliance and—more importantly—your workers’ safety. 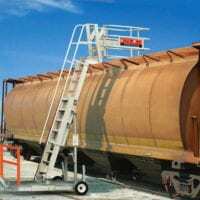 SafeRack’s flatbed loading platforms are mobile allows for safe and easy loading and tarping. Tarping a flatbed truck and its load is time-consuming and dangerous. SafeRack’s flatbed tarping systems are engineered to be safe for driver and save time, increasing truck turn. It enables a single user to tarp a load and never leave the ground. It doesn’t get any safer than that. SafeRack’s flatbed tarping systems have a simple design and are easy to operate with minimal training needed. It requires very little maintenance because it’s built with oversized motors and drives with heavy-duty construction. Tarp system can be installed to an existing building or freestanding. 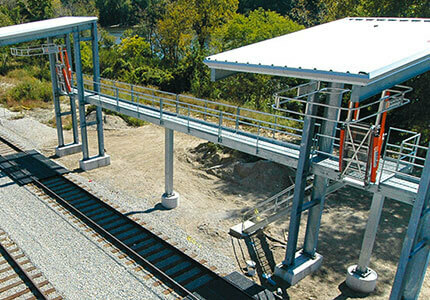 In many cases, our overhead tarping system can be installed to an existing building and consists of the bridge and drive rails. Our freestanding tarp system can be installed in your existing building or outside. 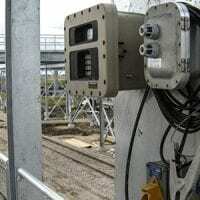 The tarp system can also integrate with SafeRack cable and arrest systems and loading platforms. Flatbed Tarping System Helps Roxul increase safety and efficiency. This video demonstrates just one example of how SafeRack has increased safety and productivity for businesses like Roxul. By focusing on the needs of Roxul, we’ve developed a unique product, useful in countless applications and industries. The SafeRack flatbed truck tarping system allows one operator to tarp a fully loaded flatbed in 15 minutes or less. 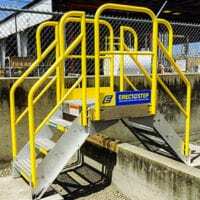 Most importantly though, it allows operation without climbing onto the truck or load, eliminating potentially unsafe working conditions. In making a better tarping system, our engineer’s top priorities were safety and simplicity. We attached the tarp spreader bar at multiple locations to eliminate boom swing and tarp twisting common in other systems. Next, we eliminated the potentially unstable equipment some systems require operators attach to trailers to keep tarps from catching on truckloads. These simple design decisions make the SafeRack truck tarping system the safest, easiest way to tarp trucks on the market, but don’t take our word for it. Watch the video above to see how Roxul Inc, went from a dangerous, 2.5-hour manual tarping process to a safe 15-minute solution.